The Quota...what can I say...it was cheap. I dragged my daily driver "Darth Quota" out to Willow Springs one race weekend had Louie Louie at L&L Motorsports dyno tune it via Power Commander Tuning Link. The goal was to try to remove the part throttle (less than 1/8 throttle) hesitation misfire and lack of driveability. Yeah, a whopping 62 horsewpower. Whoopee. Thank the clunky Quota-only throttle bodyies and the long 2 into 1 exhaust. I may throw an old 2 into 2 system on it if I get really bored. Mostly, I'll justy drive it back and forth to work and jump the occasional curb with it. Specs: stock airbox (I forgot to cut the top off before I dynoed it...), Obnoxious open FMF pipe. Otherwise, stock. This bike was darn near unrideable when I bought it. The throttle bodies had never been synched at the factory, so the bike constantly misfired and surged. 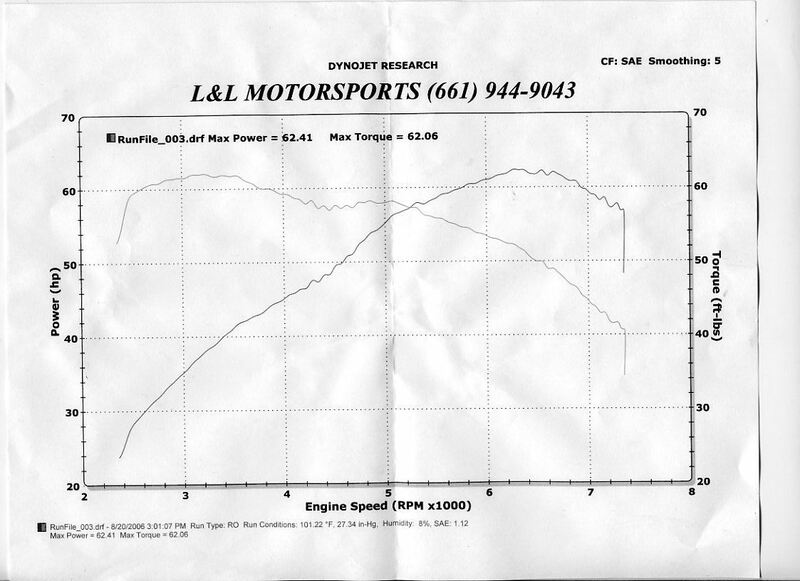 Mike Haven of MPH corrected this in my driveway in 5 minutes with my carb sticks. Sean Fader plugged this bike into the factory software at Moto Guzzi Classics to set exhaust gas trim and TPS. Even after a good setup, the bike wasn't as driveable as other injected Guzzis that I've ridden. The Tuning Link sesion cleared up most of these issues. According to louie, the USB Powercommander is superior to hte earlier ones because the map resolution is 250 RPM, rather than the 500 RPM of teh earlier units like I have on this quota. It still aint perfect, but what Guzzi is?